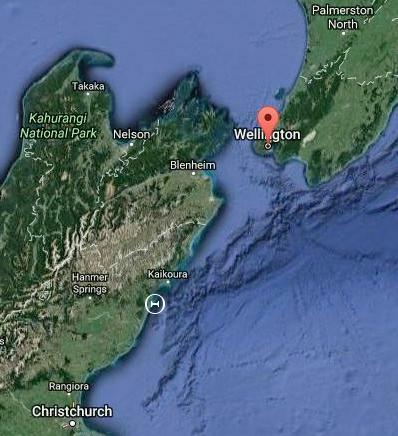 WELLINGTON, New Zealand, November 14, 2016 (ENS) – A severe earthquake struck just after three o’clock Monday morning local time near New Zealand’s South Island. The strong, long-rolling quake was felt across the South Island; thousands are evacuating after an urgent tsunami warning from the Ministry of Civil Defence and Emergency Management. Characterized as magnitude 7.8 and also as a magnitude 7.5 quake by New Zealand authorities, the U.S. Geological Survey has put the quake’s magnitude at 7.4. Thousands of people have been forced to evacuate New Zealand’s capital city of Wellington, located on the southern shore of Cook Strait, which separates New Zealand’s North and South Islands, and civil defence sirens are sounding throughout the entire country. The Ministry of Civil Defence and Emergency Management, MCDEM, is warning that the tsunami is expected on eastern coast of the North and South Islands of New Zealand shortly, in an area that includes the cities of Wellington and Christchurch and the Chatham Islands. “The first tsunami waves have arrived but it is too early to know what damage or casualties there may have been. Further waves should be expected and may be larger or more dangerous,” warned MCDEM moments ago. The water at Lyall Bay, site of the Wellington International Airport, was sucked out by 200 meters before the tsunami, and residents of low-lying areas are urgently advised to evacuate and move to higher ground. “The first wave may not be the largest. Waves may continue for several hours,” MCDEM warned. “I hope everyone is safe after the earthquake tonight. The civil defence is looking into the impact of the quake. Follow them to stay updated,” tweeted Jon Key, the country’s prime minister just after the quake. Civil Defence Minister Gerry Brownlee says there are some reports of casualties in the Kaikoura area, but he says their nature and extent is not yet known. 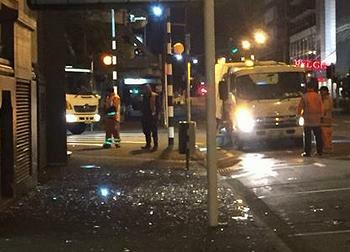 There has been major damage to some buildings in Wellington, and water pipes burst in the capital city and the bridge at the Wellington interisland ferry terminal has collapsed. The Ministry of Civil Defence and Emergency Management, MCDEM, has issued a tsunami warning for Eastern coast of North and South Island including the Chatham Islands. “It may arrive in the Eastern Coast of the North Island shortly. Move inland or to higher ground immediately,” warned MCDEM. “A tsunami has been generated. Waves are expected to arrive at the Chatham islands immediately – anyone in the Chathams should move to high ground urgently,” said MCDEM. The closest populated area to the epicenter is Hanmer Springs, a small town in the Canterbury region of the South Island. Power and phone lines are believed to be out for the small town, only a few kilometres east of earthquake’s epicentre. Hanmer Springs is a popular tourist destination built around hot springs produced by the fractured rock bed along the Hanmer fault. Within two hours of the main quake, nine aftershocks had occurred, ranging in size from magnitude 4.9 to M 6.2 and extending from the region of the mainshock epicenter to about 150 km (93 miles) to the northeast. The Pacific-Australia plate boundary region in northern South Island has a history of large earthquakes, both along the plate boundary proper and distributed around the plate boundary. The current event is the largest in the region since June 1929 when a magnitude 7.3 earthquake struck 100 km to the northwest. That June 1929 earthquake occurred three months after the March 1929 Arthur’s Pass strike-slip earthquake, just 90 km to the west-southwest of the current event. Today’s quake is about 100 km (60 miles) to the north of the city of Christchurch, which was severely damaged by a series of large earthquakes in 2010-2015, including a magnitude 7.0 quake to the west of Christchurch in September 2010, and a magnitude 6.1 directly beneath the city in February 2011. 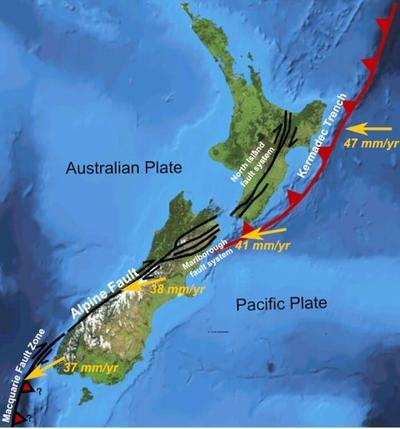 Earthquakes in New Zealand are due to the country being part of the Pacific Ring of Fire, which is geologically active. About 20,000 earthquakes, most of them minor, are recorded each year. About 200 of these are strong enough to be felt. As a result, New Zealand has very stringent building regulations.